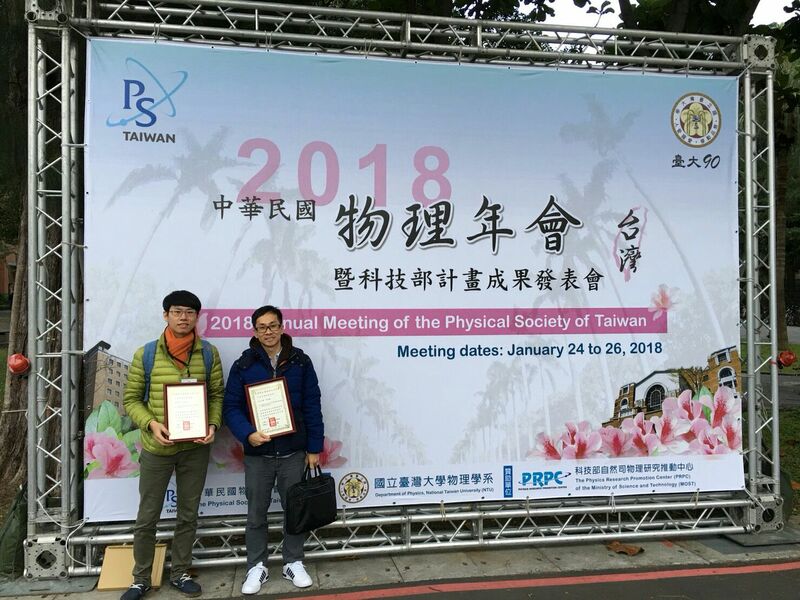 Mr. Bo Han Chen and Mr. Hsin Yu Kao won the "Student Paper Award" at Annual Meeting of PSROC 2018 held in Taipei, January 24-26, 2018. 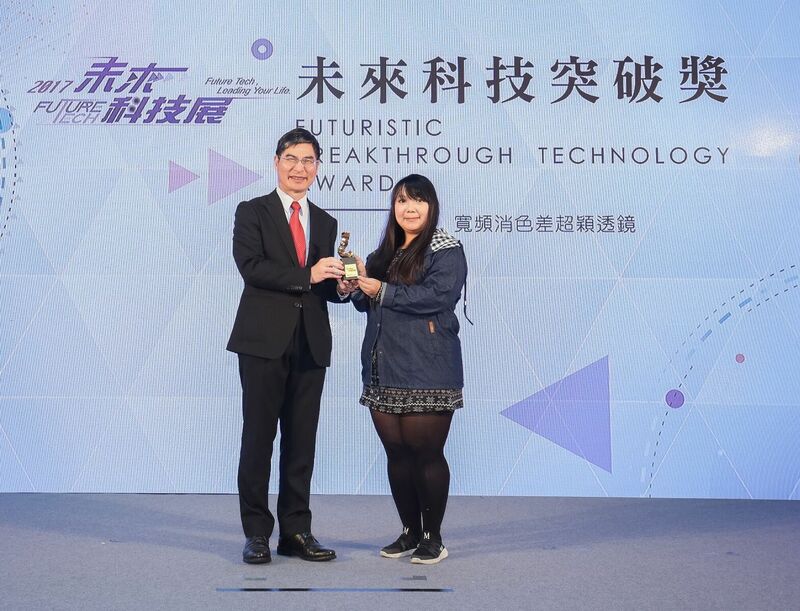 Photonics / Nano-Science & Technology Laboratory won the grant "Futuristic Breakthough Technology Award" at Future Tech 2017 held in Taipei, December 30, 2017. 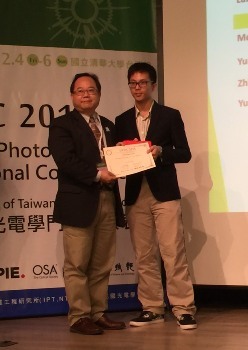 Mr. Tsung Lin Chung won the grant "Student Oral Award" " at Optics & Photonics Taiwan, the International Conference (OPTIC 2017) held in Kaohsiung, December 7-9, 2017. 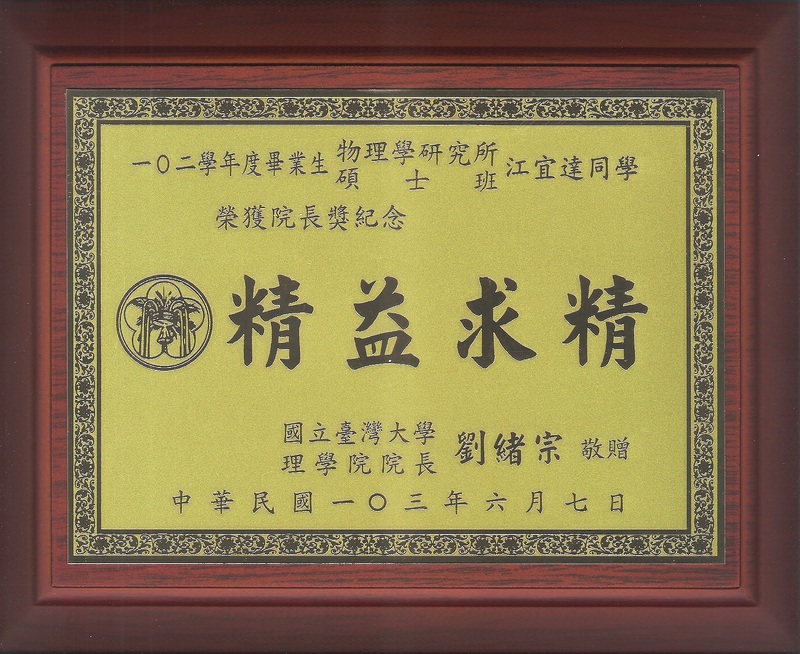 恭賀 實驗室碩士研究生鍾宗霖 榮獲2017 國際光電研討會 「OPTIC 2017 The Student Oral Award」!！! 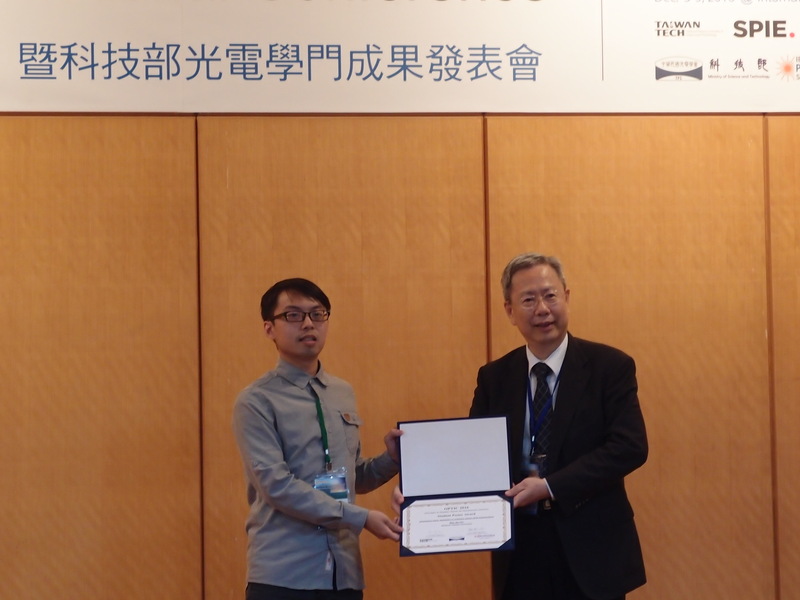 Mr. Bo Han Chen won the grant "Student Paper Award" " at Optics & Photonics Taiwan, the International Conference (OPTIC 2017) held in Kaohsiung, December 7-9, 2017. 恭賀 實驗室博士研究生陳柏翰 榮獲2017 國際光電研討會 「OPTIC 2017 The Student Paper Award」!！! 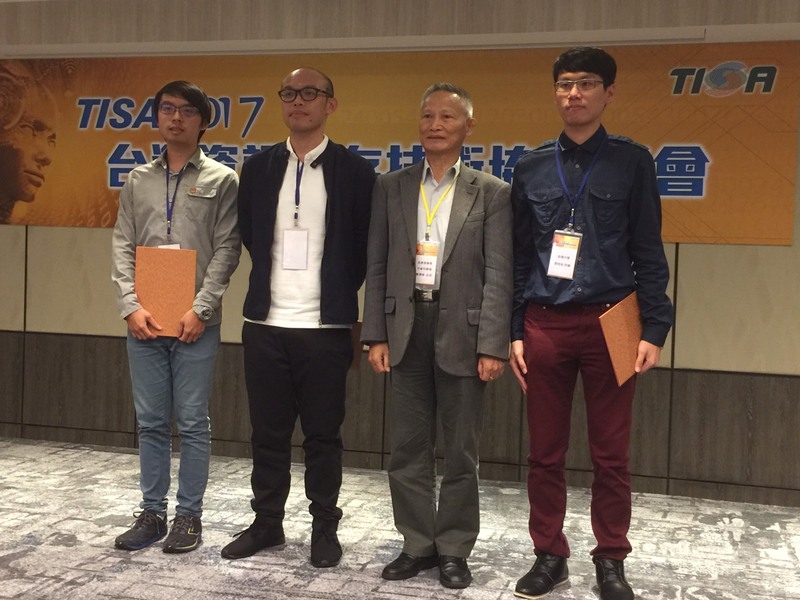 Mr. Bo Han Chen, Ms. Yu Han Chen and Mr. Tsung Lin Chung won the grant "Student Paper Award"The Taiwan Information Storage Association (TISA 2017) held in Taipei, Nov. 1, 2017. 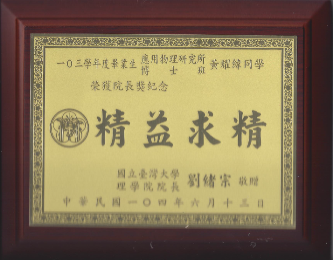 恭賀 實驗室博士研究生陳柏翰與碩士研究生陳郁涵、鍾宗霖 榮獲 台灣資訊儲存協會(TISA) 「學生海報獎」優等!!! 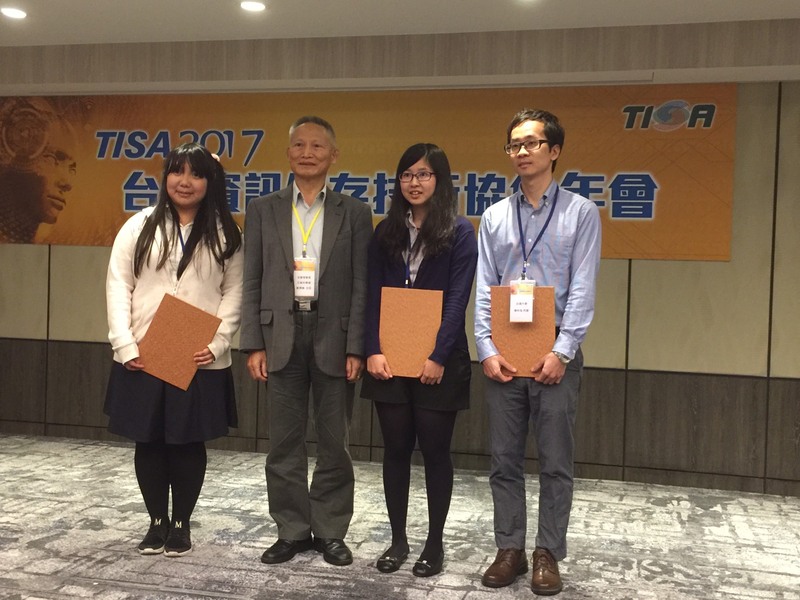 Mr. Mu Ku Chen, Ms. Hsin Yu Kao and Mr. Ren Jie Lin won the grant "Student Paper Award"The Taiwan Information Storage Association (TISA 2017) held in Taipei, Nov. 1, 2017. 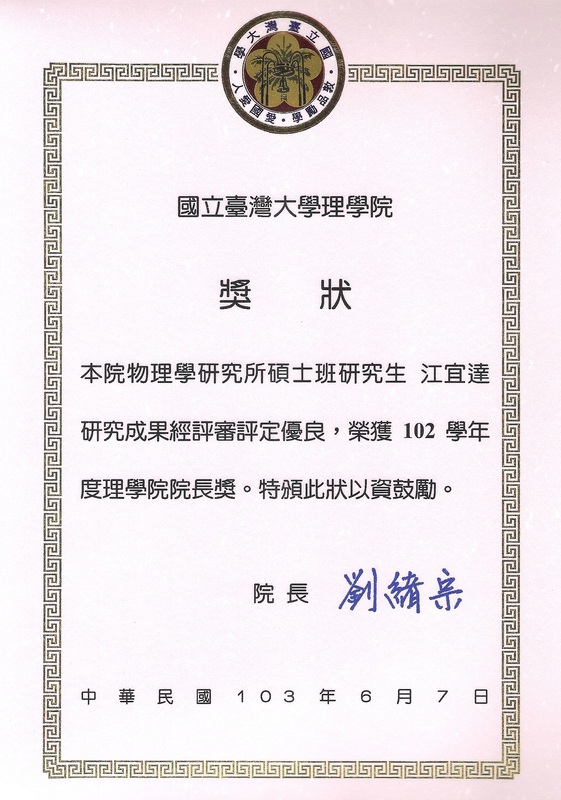 恭賀 實驗室博士研究生陳沐谷、郭信佑與碩士研究生林仁傑 榮獲 台灣資訊儲存協會(TISA) 「學生海報獎」佳作!!! 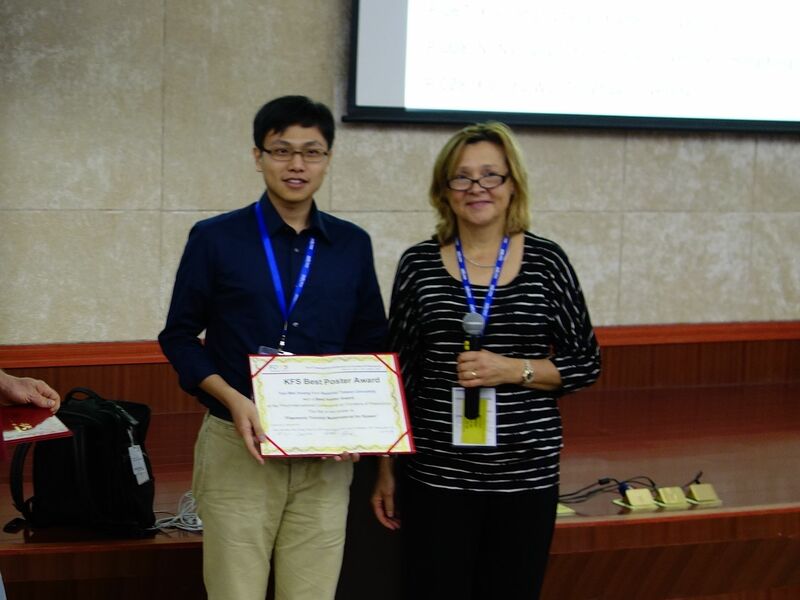 Mr. Yi Chieh Lai won the grant "Student Oral Paper Award" at The Asia-Pacific Conference on Near-field Optics (APNFO) held in Tainan, July 10-13, 2017. 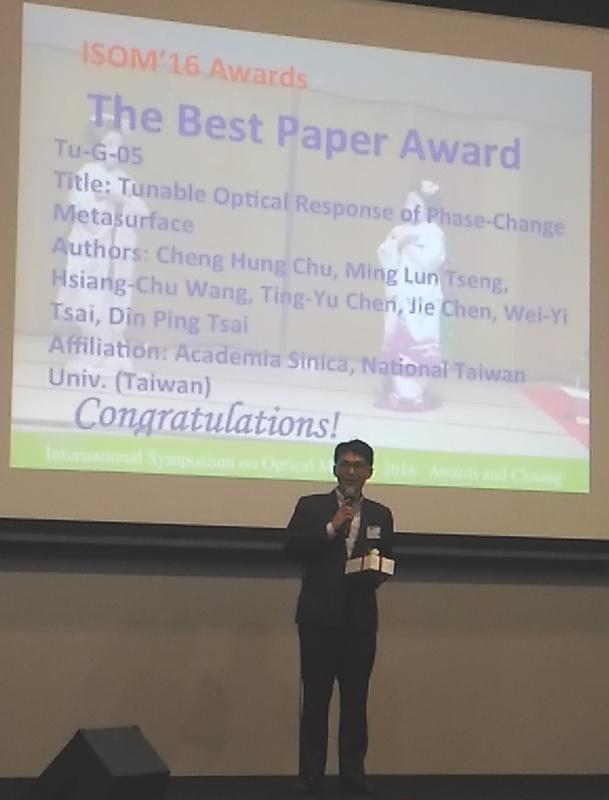 Mr. Tsung Lin Chung won the grant "Student Paper Award" at The Asia-Pacific Conference on Near-field Optics (APNFO) held in Tainan, July 10-13, 2017. 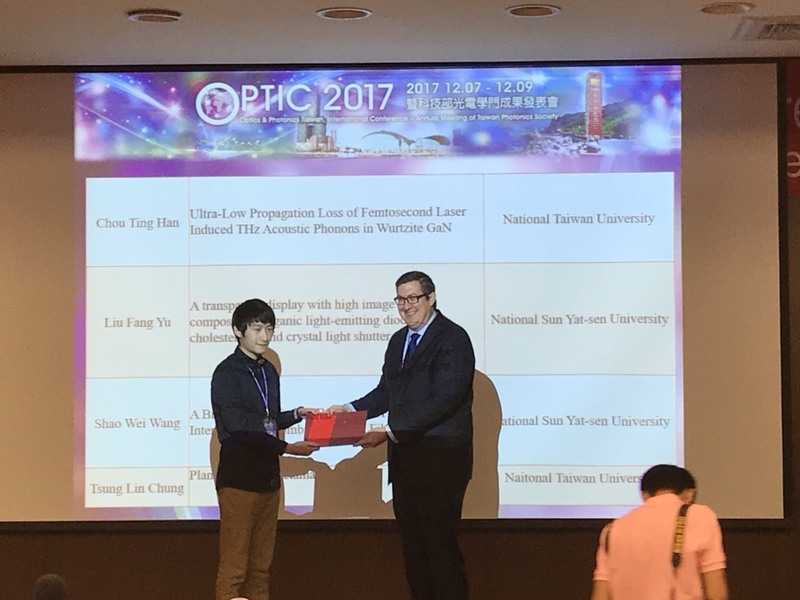 Mr.Wei Hou Lee won the grant "Student Paper Award" at The 8th International Conference on Surface Plasmon Photonics in Taipei, May 22-26, 2017. 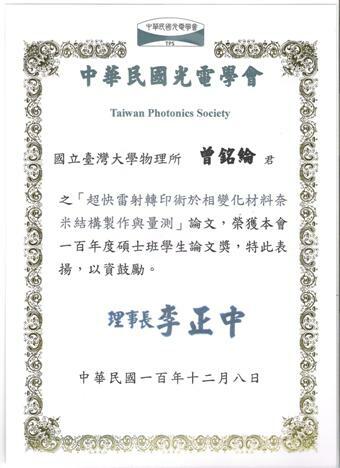 Mr. Tsung Lin Chung and Mr. Ren Jie Lin won the grant "Student Paper Award" at annual Meeting of Taiwan Photonics Society held in Taipei, December 3-5, 2016. 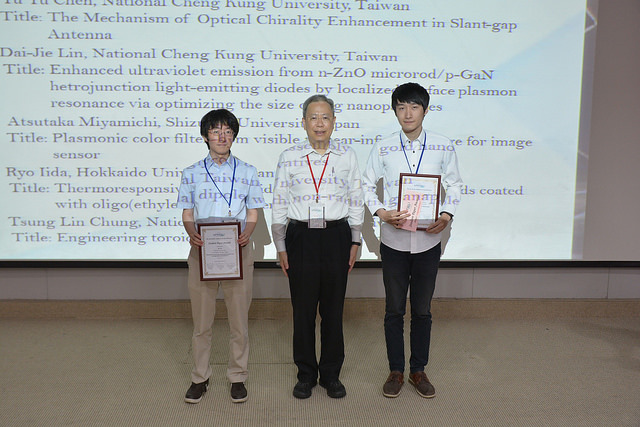 Mr. Tsung Lin Chung won the grant at Global Nanophotonics 2016 held in Osaka, Nov. 30 - Dec. 1, 2016. 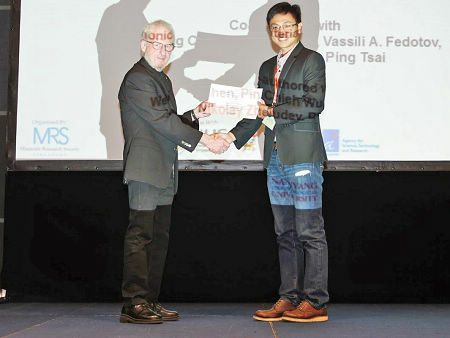 Prof. Din Ping Tsai honored by American Association for the Advancement of Science, is now a fellow of AAAS! 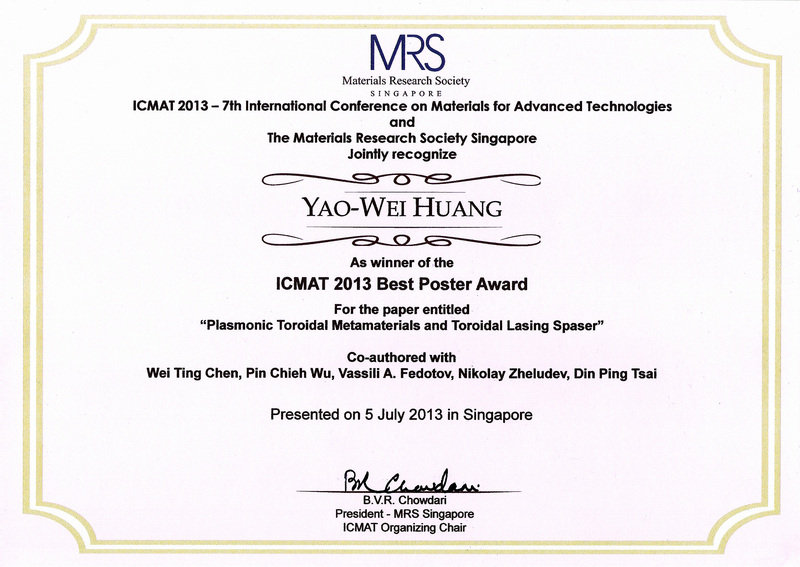 American Association for the Advancement of Science, AAAS. 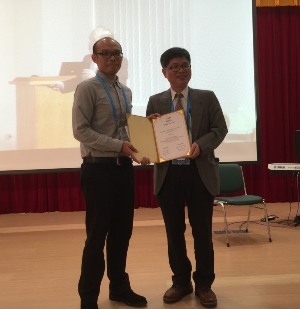 Dr. Cheng Hung Chu won the grant at International Symposium on Optical Memory (ISOM 2016) held in Kyoto, Oct. 16-20, 2016. 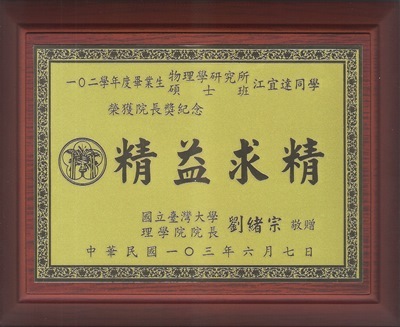 恭賀實驗室博士後研究員朱正弘 榮獲The International Symposium on Optical Memory (ISOM 2016) 國際會議 「最佳論文獎」! 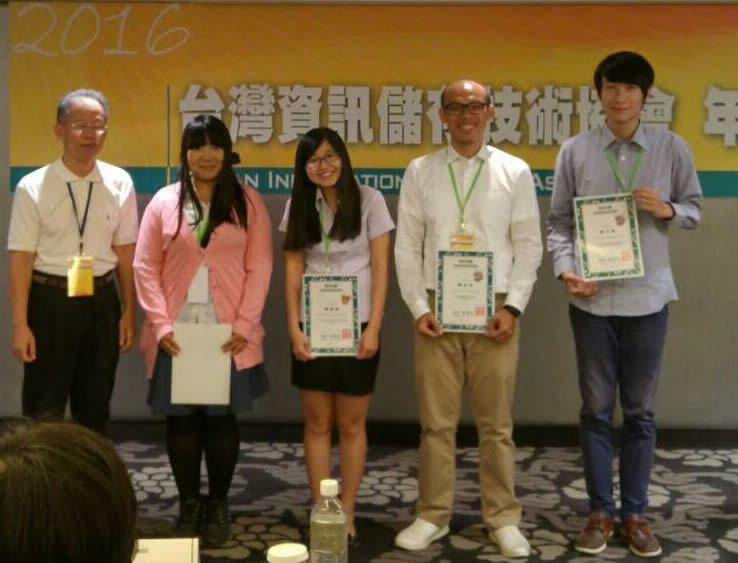 Mr. Mu Ku Chen, Ms. Jia-Wern Chen, Ms. Yu Han Chen and Mr. Tsung Lin Chung won the grant at The Taiwan Information Storage Association (TISA 2016) held in Taipei, Oct. 5, 2016. 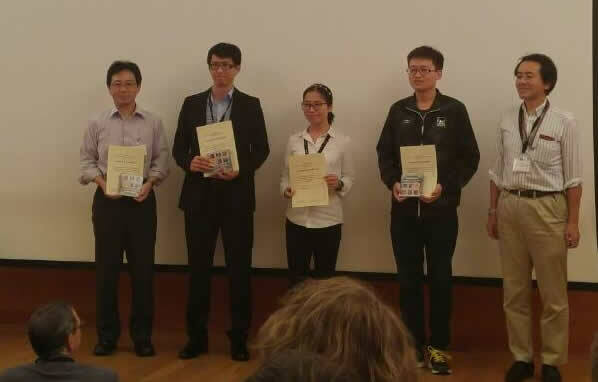 Mr. Hsiang-Chu Wang won the grant at The European Phase Change and Ovonic Symposium (E\PCOS 2016) held in Cambridge, Sep. 4-6, 2016. 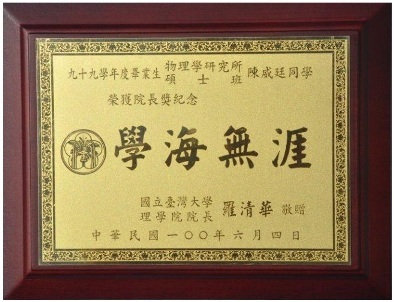 恭賀實驗室研究助理王祥舉 榮獲 The European Phase Change and Ovonic Symposium (E\PCOS 2016) 國際會議「最佳壁報論文獎」! 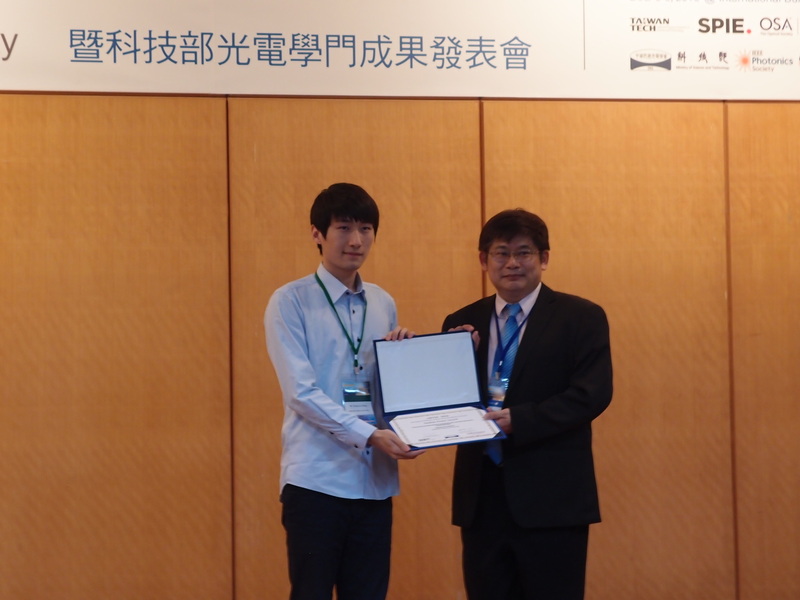 Mr. Mu Ku Chen won the grant at The 17th Japan Society of Applied Physics (The 17th JSAP ) held in Toki Messe, Sep. 13-16, 2016. 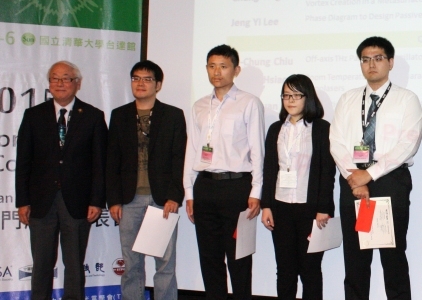 Prof. Din Ping Tsai won the 14th " Y. 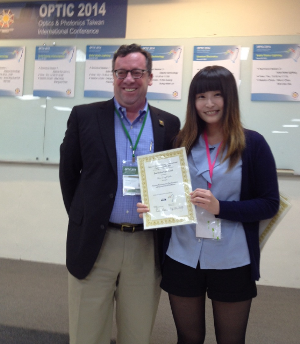 Z. Hsu Scientific Paper Award." 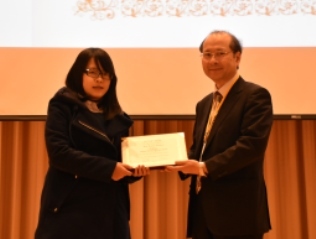 Ms. Pei Ru Wu won the "Best Poster Award" at The 9th International Conference on Nanophotonics (ICNP 2016) held in Academia Sinica, March 21-25, 2016. 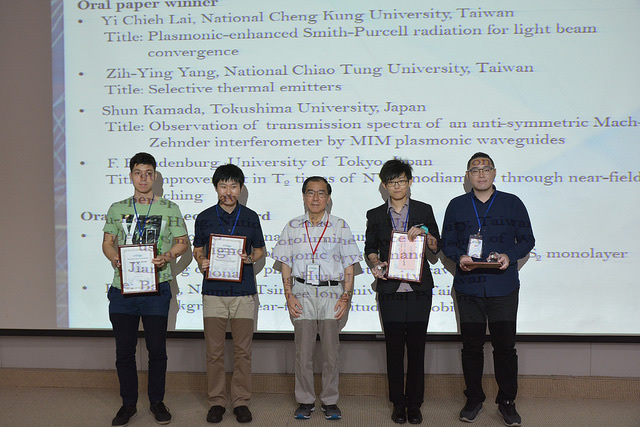 恭賀實驗室碩士研究生吳佩茹 榮獲 The 9th International Conference on Nanophotonics (ICNP 2016) 國際會議「最佳壁報論文獎」! 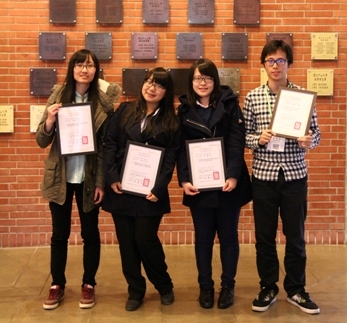 Ms. Ting-Yu Chen, Ms. Jia-Wern Chen, Ms. Pei Ru Wu and Mr. Yi-Hao Chen won the "Student Paper Award" at Annual Meeting of PSROC 2016 held in Kaohsiung, January 25-27, 2016. 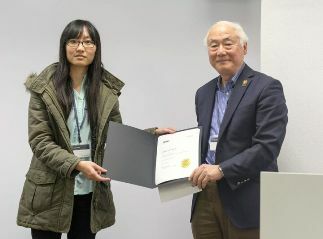 Ms. Ting-Yu Chen won the "SPIE 2015 Student Paper Award" at Asian Core Student Meeting 2015 held in Osaka, Japan, December 8-9, 2015. 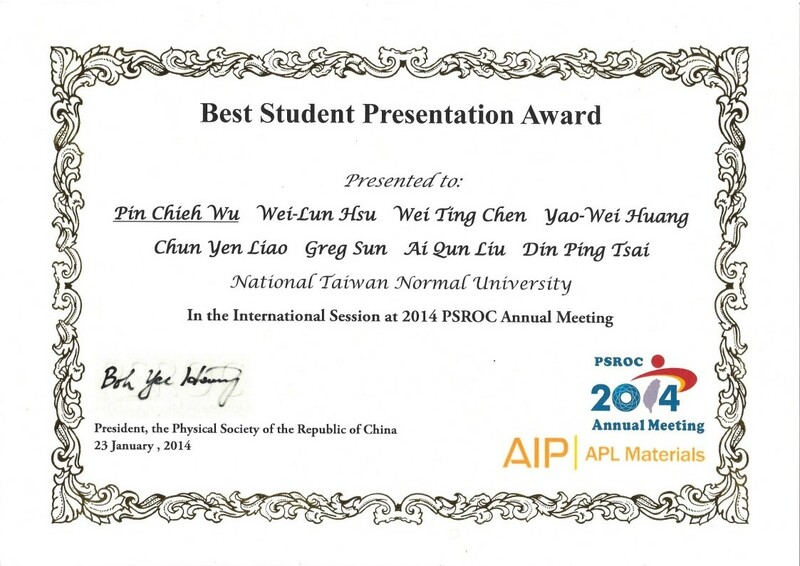 恭賀 實驗室碩士研究生陳亭伃榮獲 Asian Core Student Meeting 2015 國際學生會議 「SPIE Student Paper Award」! 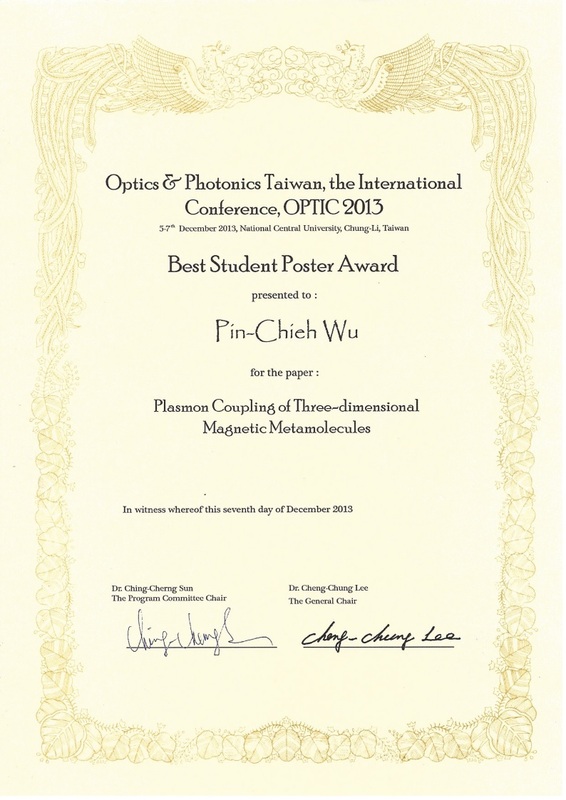 Ms. Pei Ru Wu won the "OPTIC 2015 Student Paper Award" at annual Meeting of Taiwan Photonics Society held in Hsinchu, December 4-6, 2015. 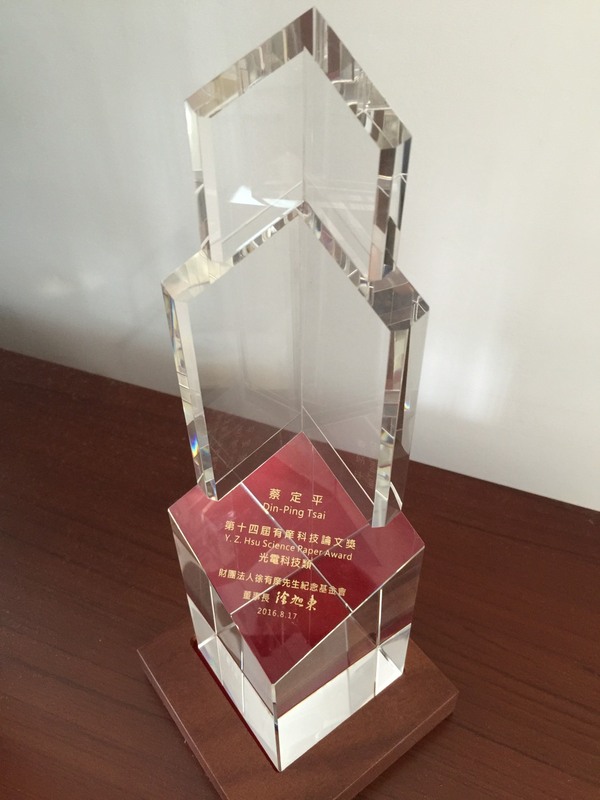 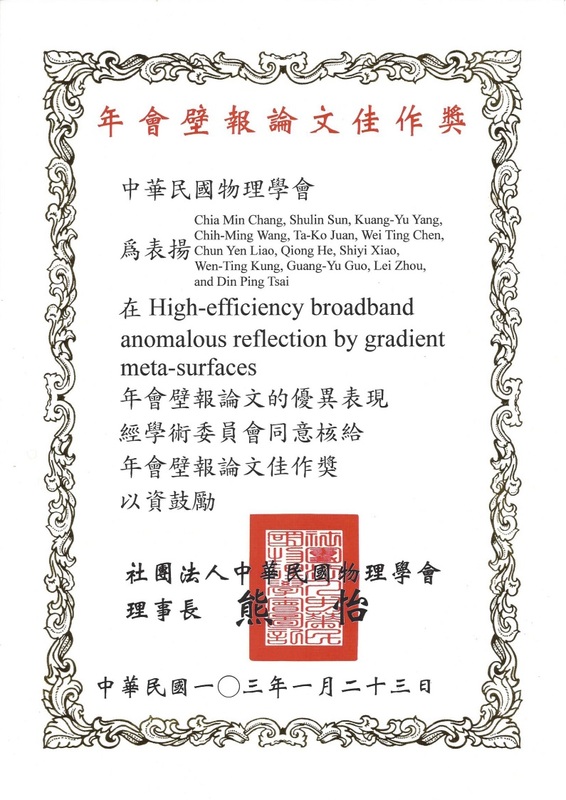 恭賀 實驗室碩士研究生吳佩茹榮獲 2015 國際光電研討會 「OPTIC 2015 Student Paper Award」! 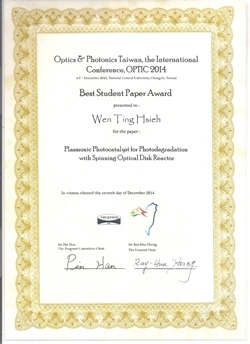 Mr. Yi-Hao Chen won the "OPTIC 2015 Student Paper Award" at annual Meeting of Taiwan Photonics Society held in Hsinchu, December 4-6, 2015. 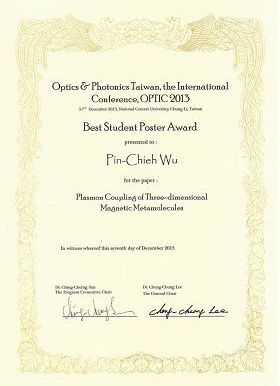 恭賀 實驗室碩士研究生陳奕豪榮獲 2015 國際光電研討會 「OPTIC 2015 Student Paper Award」! 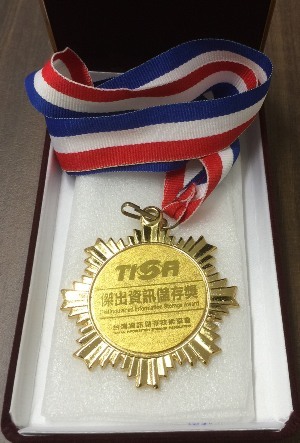 Prof. Din Ping Tsai won the "Distinguished Information Storage Award" at annual Meeting of Taiwan Information Storage Association held in Taipei, October 23, 2015. 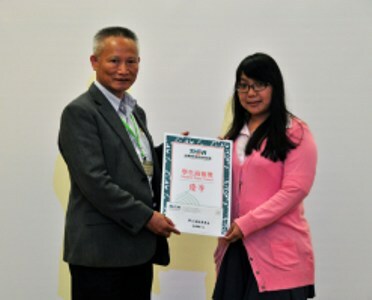 Ms. Jia-Wern Chen won the "Student Paper Award" at annual Meeting of Taiwan Information Storage Association held in Taipei, October 23, 2015. 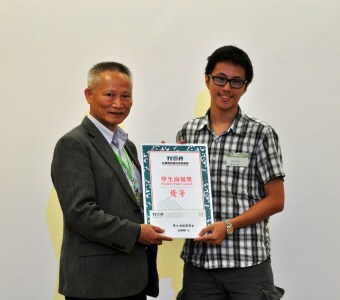 Mr. Yi-Hao Chen won the "Student Paper Award" at annual Meeting of Taiwan Information Storage Association held in Taipei, October 23, 2015. 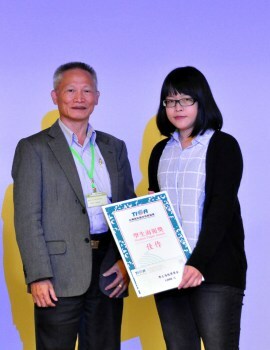 Ms. Pei Ru Wu won the "Student Paper Award" at annual Meeting of Taiwan Information Storage Association held in Taipei, October 23, 2015. 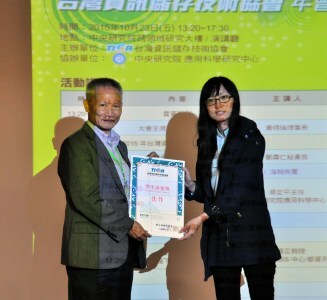 Ms. Ting-Yu Chen won the "Student Paper Award" at annual Meeting of Taiwan Information Storage Association held in Taipei, October 23, 2015. 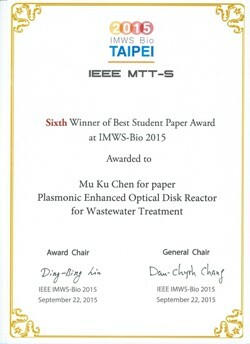 Mr. Mu-Ku Chen won the "Best Student Paper Award" at 2015 IEEE MTT-S International Microwave Workshop Series on RF and Wireless Technologies for Biomedical and Healthcare Applications (IMWS-Bio 2015) held in Taipei, September 21-23, 2015. 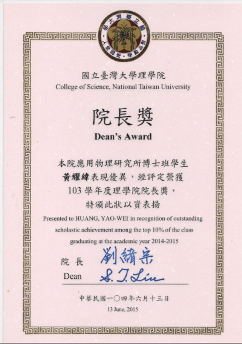 Dr. Yao-Wei Huang won the "Dean's Award" PhD degree in College of Science, National Taiwan University in 2015. 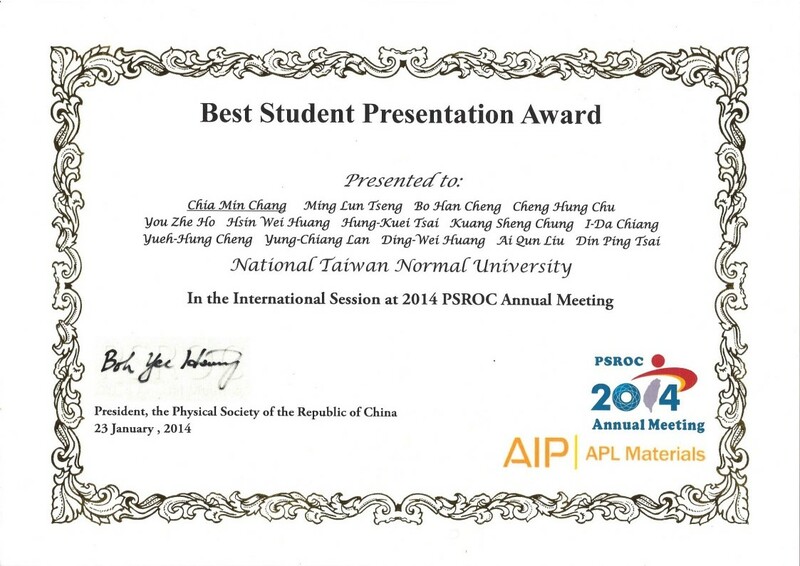 Ms. Wen Ting Hsieh won the "Best Student Paper Award" at 2014 Annual Meeting of Taiwan Photonics Society held in Taichung from December 4-5, 2014. 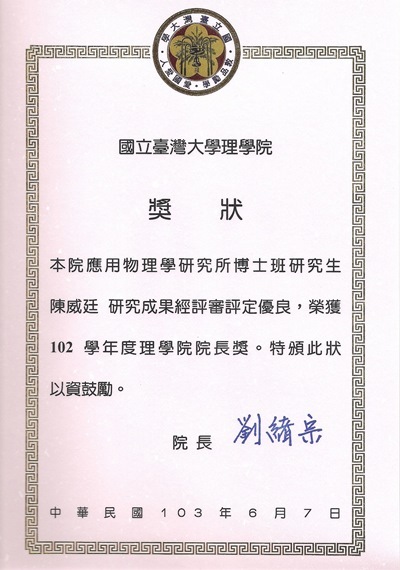 Dr. Wei Ting Chen and Dr. Ming Lun Tseng won the "Dean's Award" PhD degree in College of Science, National Taiwan University in 2014. 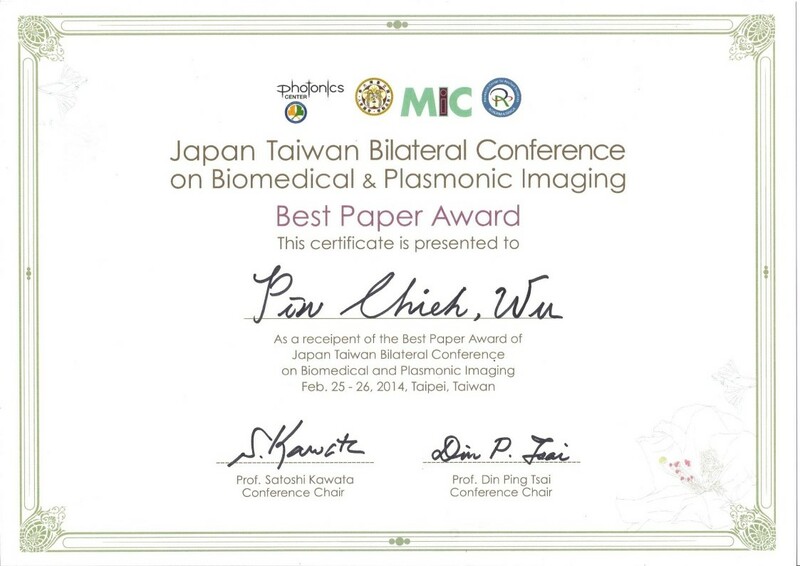 Mr. I-Da Chiang won the "Dean's Award" MS degree in College of Science, National Taiwan University in 2014. 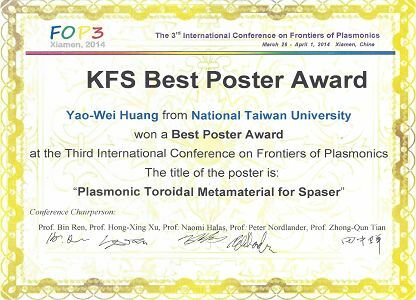 Mr.Yao-Wei Huang won the "Best Poster Award" at The 3rd International Conference on Frontiers of Plasmonics held in Xiamen, China from March 26 - April 1, 2014. 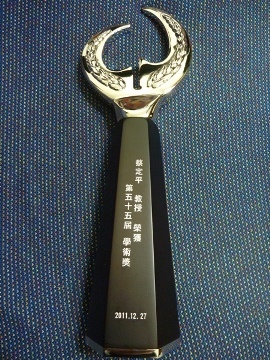 恭賀! 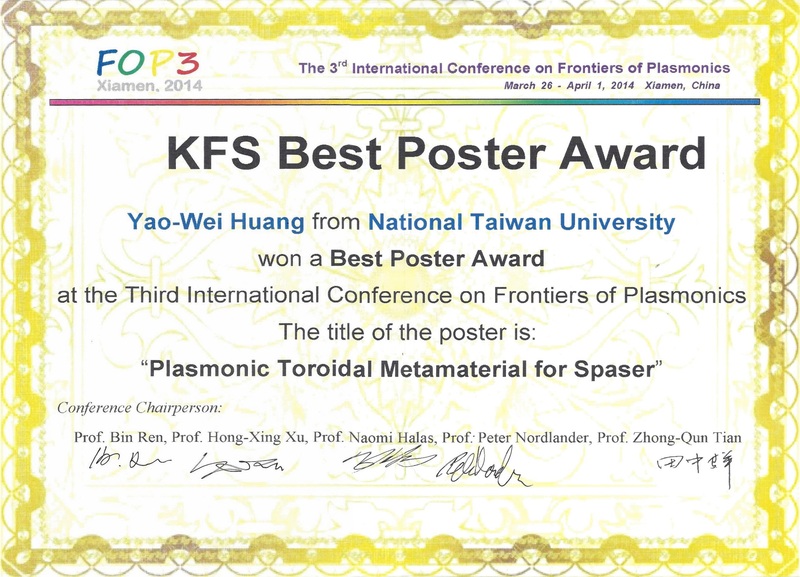 實驗室博士研究生黃耀緯同學榮獲2014年The 3rd International Conference on Frontiers of Plasmonics "最佳壁報論文獎"! 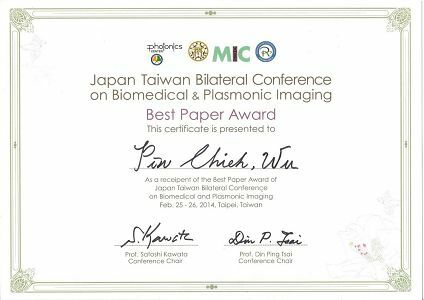 Mr. Pin Chieh Wu won the "Best Paper Award" of Japan Taiwan Bilateral Conference on Biomedical and Plasmonic Imaging held in Taipei, Taiwan from February 25-26, 2014. 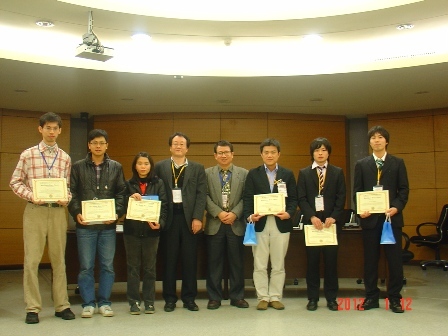 All award winners with Prof. Satoshi Kawata, Prof. Prabhat Verma and Prof. Chi-Kuang Sun. 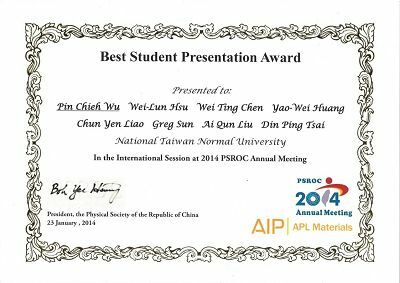 Mr. Pin Chieh Wu and Chia Min Chang won the "Best Student Presentation Award" at 2014 Annual Meeting of the Physical Society of Republic of China held in Taichung from January 21-23, 2014. 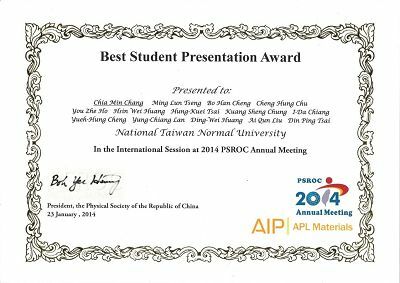 Mr. Chia Min Chang and Hao-Tsun Lin won the "Best Poster Paper Award" at 2014 Annual Meeting of the Physical Society of Republic of China held in Taichung from January 21-23, 2014. Our lab members, Mr. Wei Ting Chen, Mr. Ming Lun Tseng, Mr. Pin Chieh Wu, Mr. Chia Min Chang, and Mr. Kuang-Yu Yang received "Student Paper Award" in Optics & Photonics Taiwan, the International Conference 2013 in Zhongli, Taiwan from December 5-7, 2013. 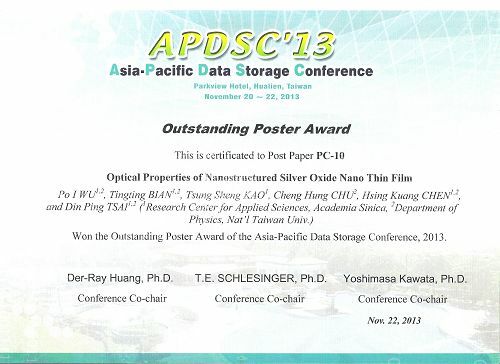 Our Research Assistant, Mr. Po I Wu won the "Best Poster Award" at 2013 Asia-Pacific Data Storage Conference (APDSC'13) in Hualien, Taiwan from November 20-22, 2013. 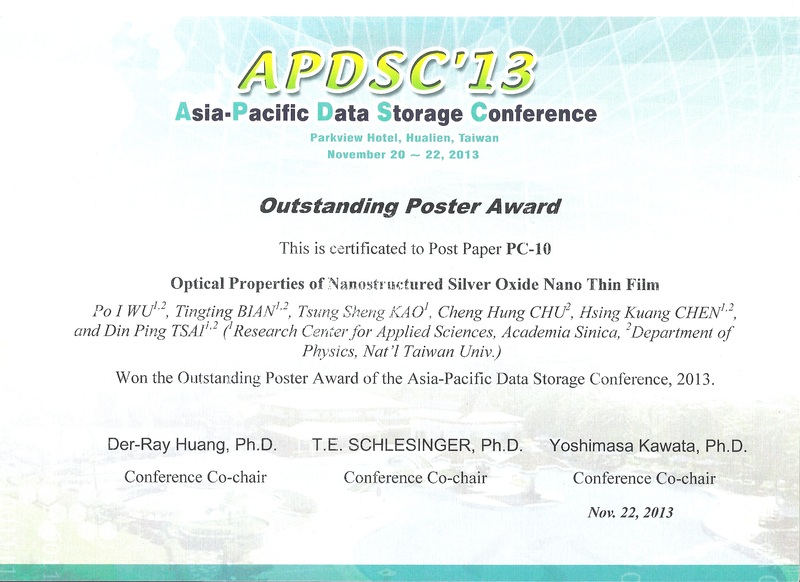 恭賀實驗室研究助理吳柏毅榮獲2013年Asia-Pacific Data Storage Conference "最佳壁報論文獎"! 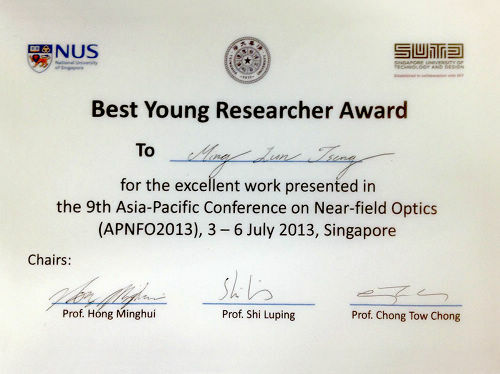 Our PhD students, Mr. Ming Lun Tseng won the "Best Young Researcher Award" at The 9th Asia-Pacific Conference on Near-field Optics (APNFO2013) in Singapore from July 3-6, 2013. 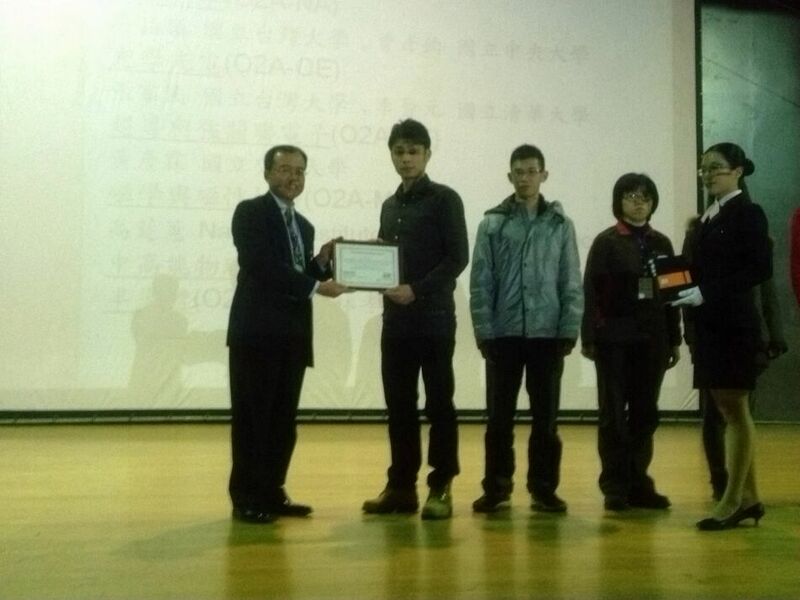 恭賀實驗室博士生曾銘綸同學榮獲2013年Asia-Pacific Conference on Near-field Optics "最佳青年學者獎"! 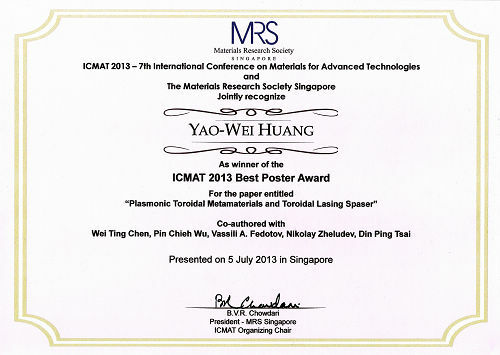 Our PhD students, Mr. Yao-Wei Huang won the "Best Poster Award" at The 7th International Conference on Materials for Advanced Technologies in Singapore from June 30 to July 5, 2013. 恭賀實驗室博士生黃耀緯同學榮獲2013年 International Conference on Materials for Advanced Technologies "最佳壁報論文獎"! Our PhD students, Mr. Wei Ting Chen won the "Best Poster Award" at International Workshop Photonics of Functional Nanomaterials held in Hong Kong from May 6-9, 2013. 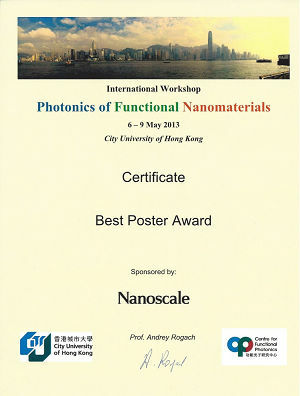 恭賀實驗室博士生陳威廷同學榮獲2013年International Workshop Photonics of Functional Nanomaterials "最佳壁報論文獎"! 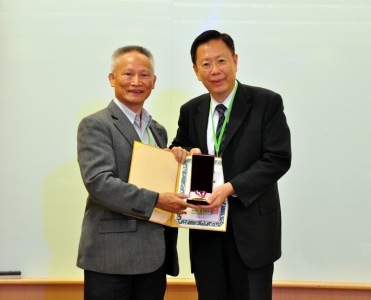 Congrats to Prof. Din Ping Tsai on receiving "Outstanding Research Award" from National Science Council (NSC), Taiwan! 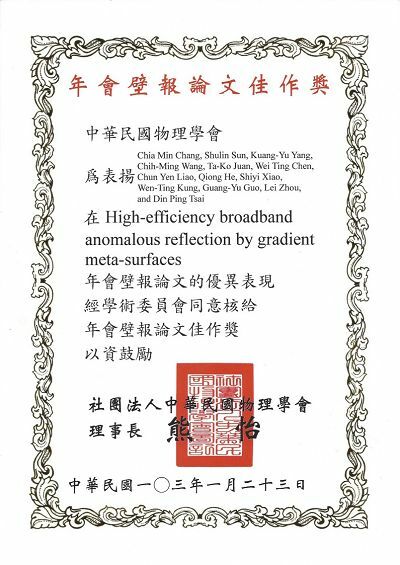 Mr. Wei Ting Chen and Wei-Lun Hsu won the "Best Poster Paper Award" at 2013 Annual Meeting of the Physical Society of Republic of China held in Hualien from January 29-31, 2013. 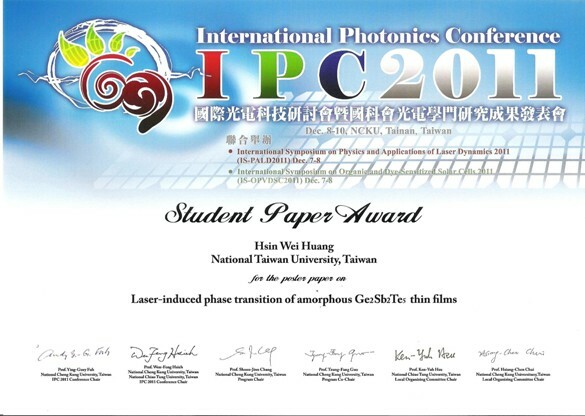 Our PhD students, Mr. Yao-Wei Huang received "2012 Best Master Thesis Award" from Taiwan Photonics Society! Mr. Pin Chieh Wu and Yao-Wei Huang won the "Dean's Award" MS degree in College of Science, National Taiwan University in 2012. 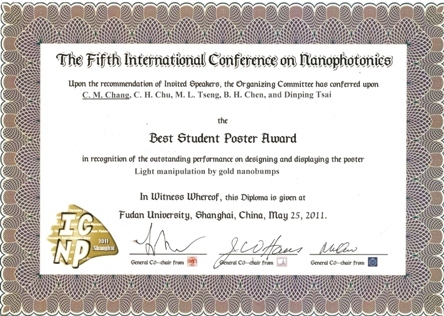 Mr. Yao-Wei Huang won the "Outstanding Poster Presentation Prize" at The Sixth International Conference on Nanophotonics (ICNP 2012) held in Beijing University, China from May 27-30, 2012. 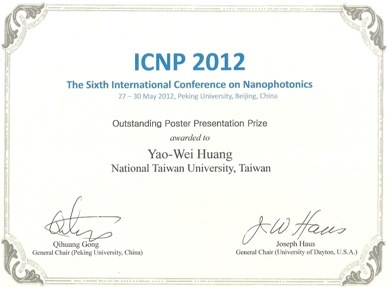 恭賀實驗室碩士研究生黃耀緯同學榮獲The Sixth International Conference on Nanophotonics (ICNP 2012) 最佳壁報論文獎! 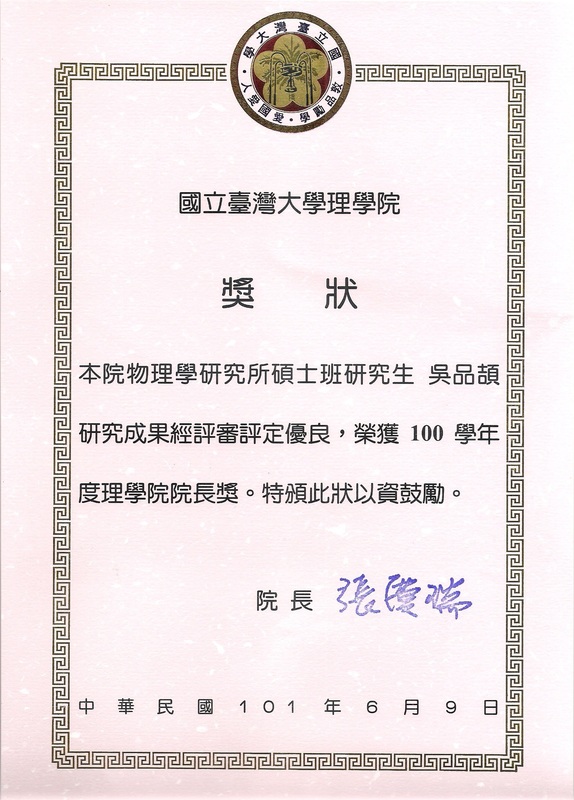 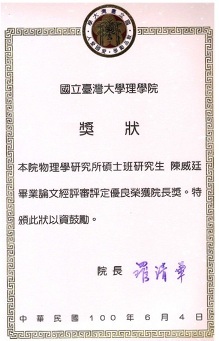 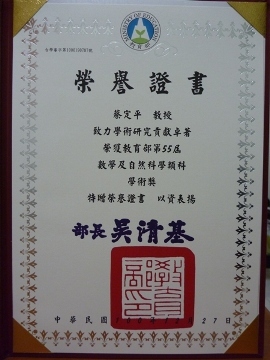 Mr. Hsin Wei Huang won the "Best Poster Paper Award" at 2012 Annual Meeting of the Physical Society of Republic of China held in Chiayi from January 17-19, 2012. 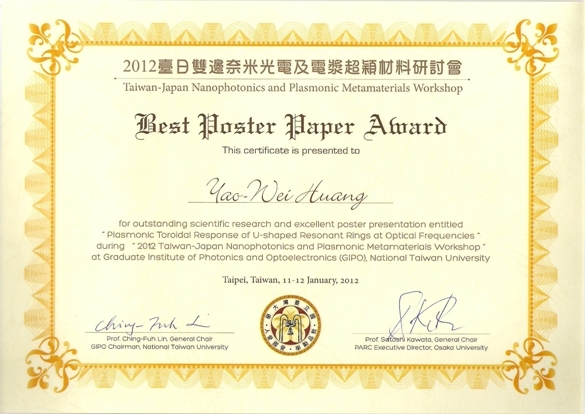 Mr. Yao-Wei Huang won the "Best Poster Paper Award" at Taiwan-Japan Nanophotonics and Plasmonic Metamaterials Workshop held in NTU, Taipei, Taiwan from Jan. 10-12, 2012. 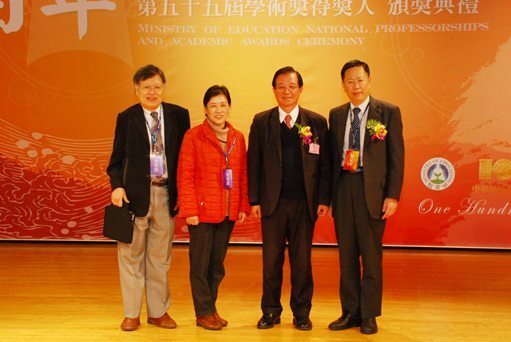 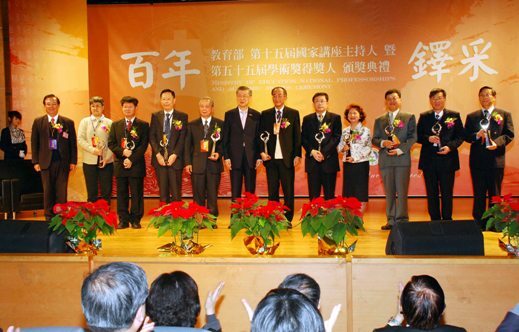 Prof. Din Ping Tsai received "The 55th Academic Award" from Ministry of Education, Taiwan!" 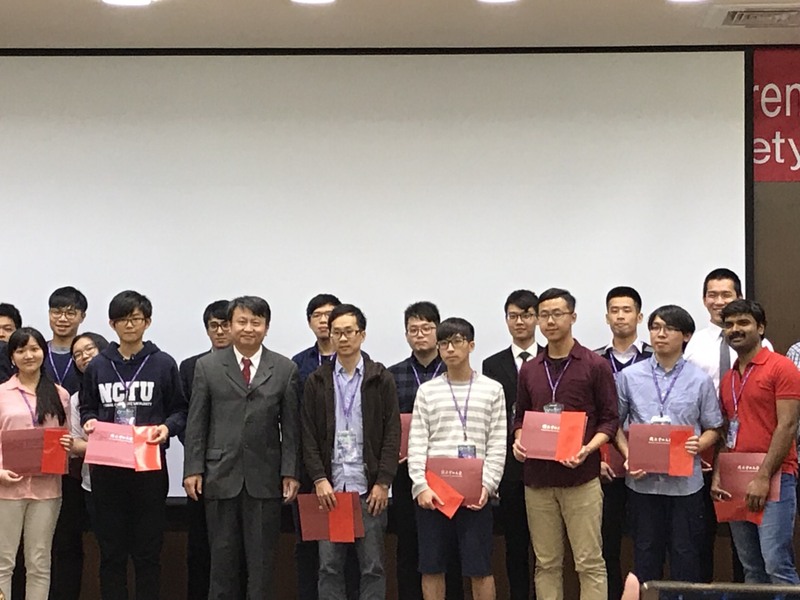 The 55th Academic Awards go to the NTU teachers: CHOU Feng-Wu, Huang Chun-Chieh, Koo Hui-Wen, Tsai Din-Ping, Cheng Shun-Jen, hired from the Center of Survey Research, in Dept. 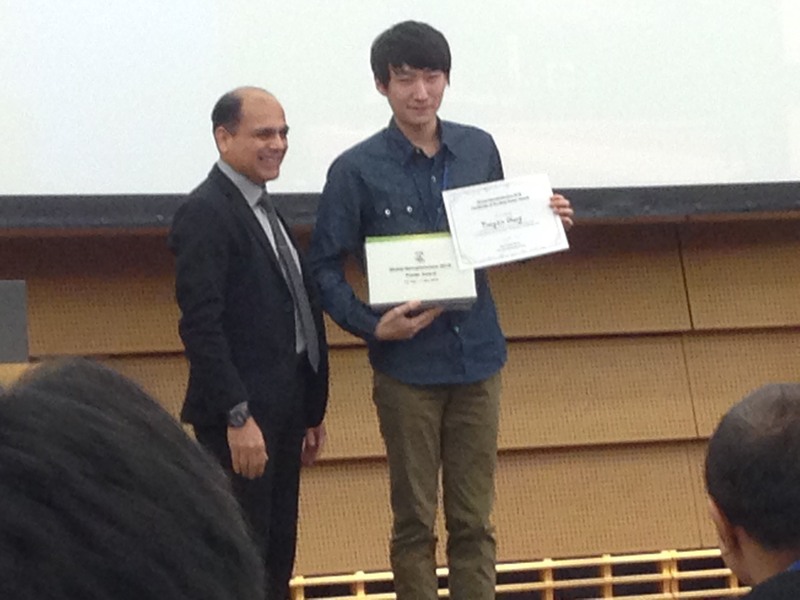 of Mathematics, NTU and Kao Jia-Hong. 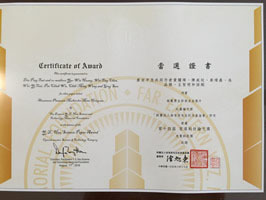 Meanwhile, there are some more distinguished NTU professors who just won the 55th Academic Award, held by the Ministry of Education, in the following areas of research: Chou Feng-Wu’s major research on paleography and excavated texts in “Arts and Humanities”, Koo Hui-Wen’s economic history and microeconomics in “Social Science”, Tsai Din-Ping’s near-field optics and nano photonics in “Mathematics and Natural Science”, Cheng Shun-Jen’s (, hired from the Center of Survey Research, in Dept. of Mathematics, NTU) mathematics in “Mathematics and Natural Science”, and Kao Jia-Hong’s gastroenterology in “Biological science and Biology Digest”. 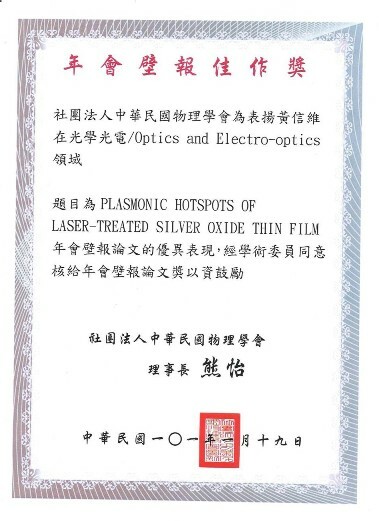 Professor Tsai has been doing the research on near-field optics and nano photonics ever since 1986. 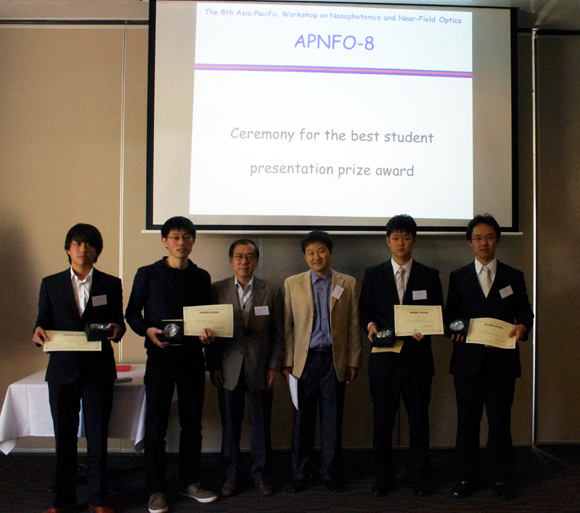 He’s the first scholar presenting the research topic on the integrated-optic waveguide using the theory of near-field optics in 1990. 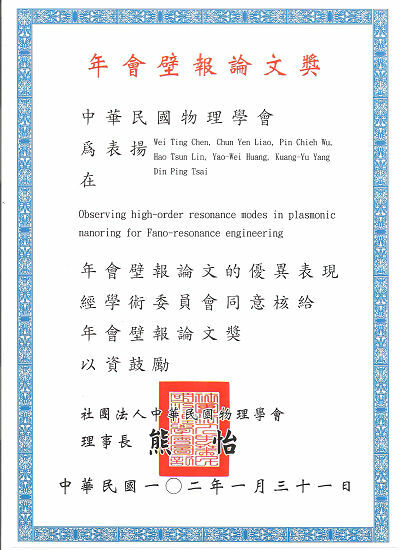 Later in 1994, Tsai’s interests of research made him an influential scholar working on the observation of near-field optics along with Raman spectrum. 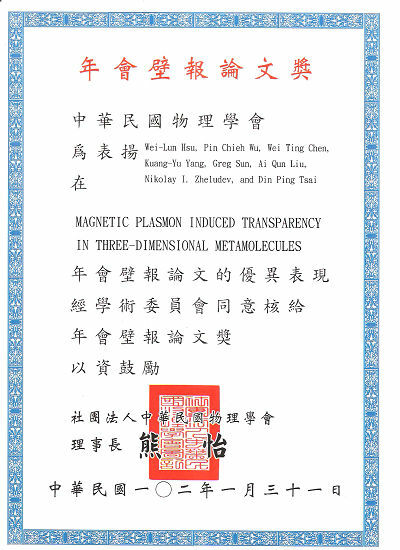 Once again in 1994, he proceeded to practice the measure of near-field optics to prove the effect of localized surface plasmon, and its publication on Physics Review Letter has already been quoted over 179 times. 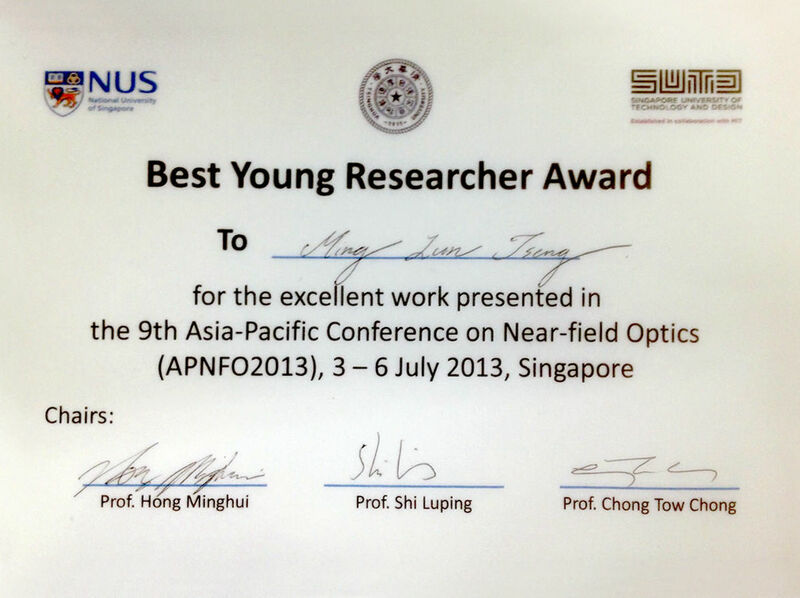 Professor Tsai is thus viewed as the leading figure working on the practical research of near-field optics. For the past three years, Professor Tsai’s essays have been quoted as the reference over 200 times every year and over 2539 times in total. 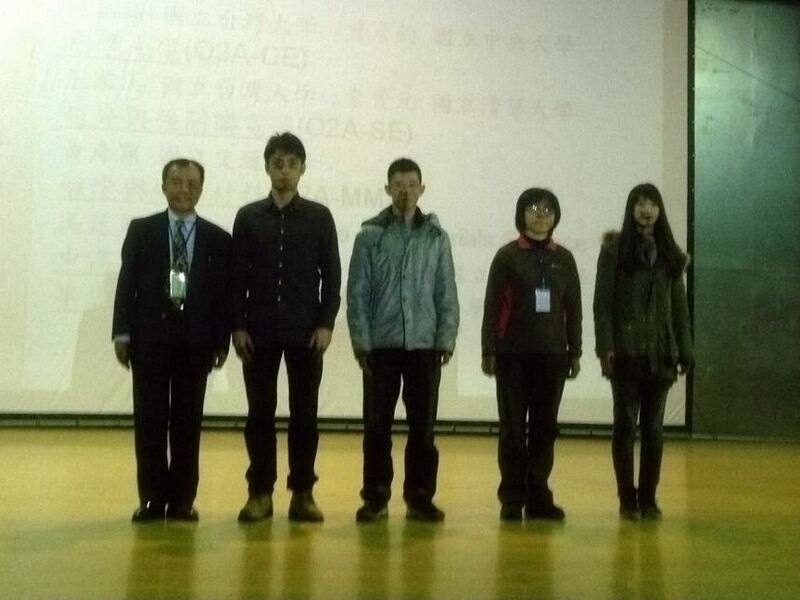 He’s been invited to international conferences to do special presentations over 102 times. 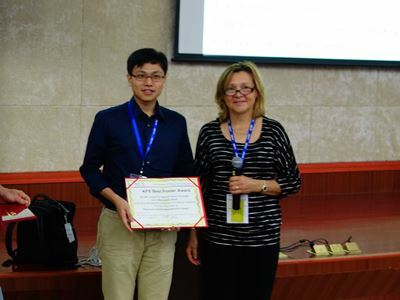 Currently he works as one of the editors among four international journals and does the peer-review for them frequently. 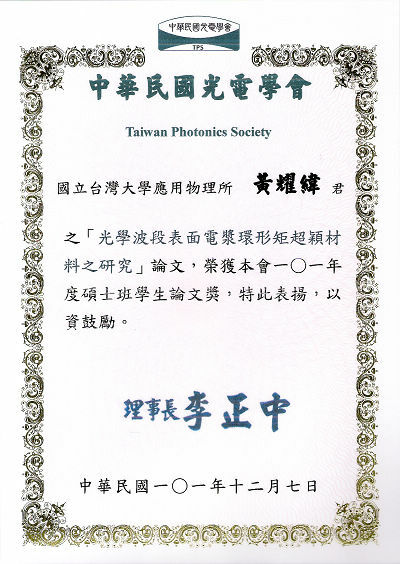 Professor Tsai makes use of the basic physic concepts onto the research of nano optics along with great value of invention and practices, and he’s thus acknowledged and approved among the scholars in this field. 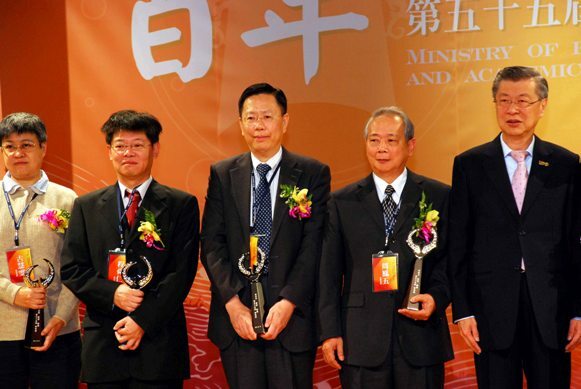 He’s shared seven of his techniques with corporations, which made him a key figure in Taiwan with great contribution to both theoretical research and practical development. 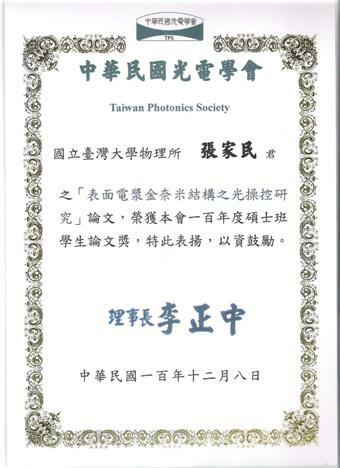 Our PhD students, Mr. Ming Lun Tseng and Mr. Chia Min Chang received "2011 Best Master Thesis Award" from Taiwan Photonics Society! 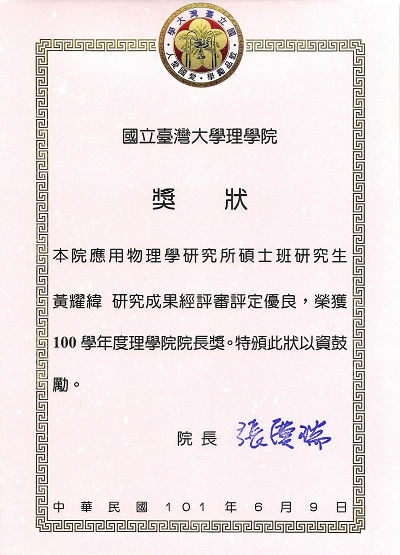 Our lab members, Mr. Hsin-Wei Huang, Mr. Yao-Wei Huang, and Mr. Kuang Yu Yang, received "Student Paper Award" in International Photonics Conference 2011 held at Tainan, Taiwan from Dec 8-10, 2011. 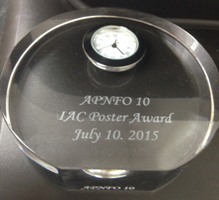 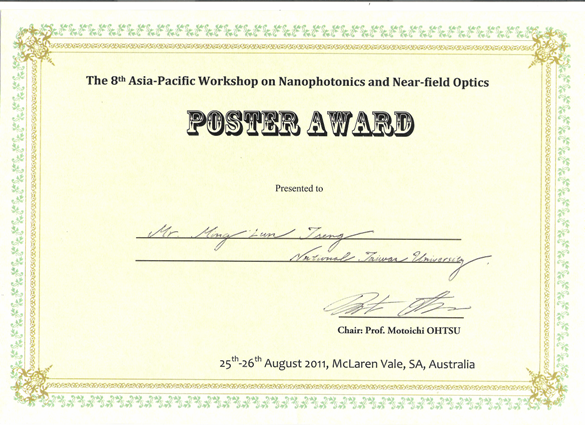 Congrats to our lab member, Mr. Ming Lun Tseng, who received "The Best Poster Award" at The 8th Asia-Pacific Conference on Nanophotonics and Near-Field Optics (APNFO8)! 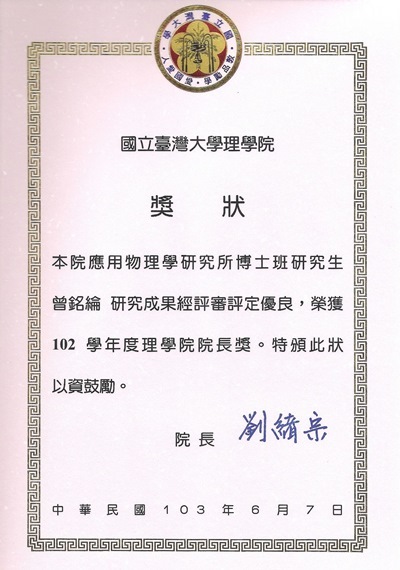 賀台大物理系光電及奈米科學與技術實驗室研究團隊曾銘綸同學榮獲於澳洲雪梨舉辦之The 8th Asia-Pacific Conference on Nanophotonics and Near-Field Optics (APNFO8)國際會議頒發「The Best Poster Award」! 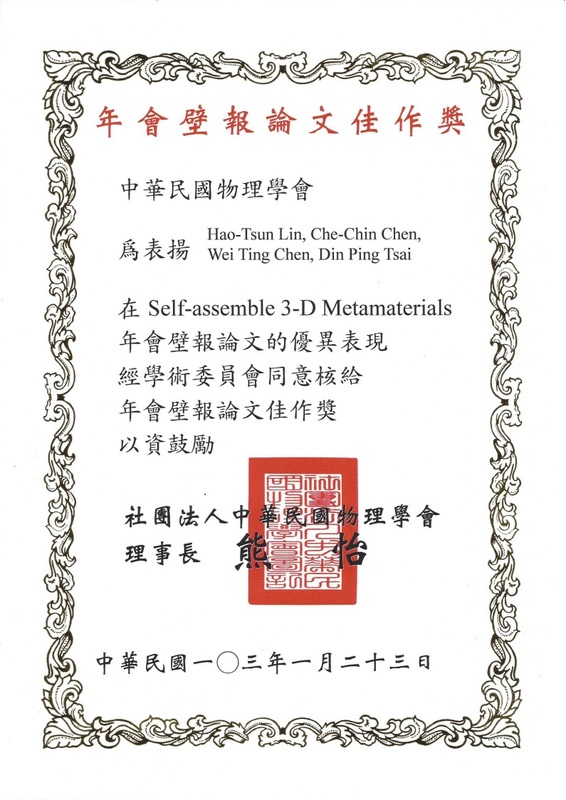 Congrats to our lab member, Mr. Hsin Wei Huang, Chung Hao Lu, Chia Min Chang, Dr. Cheng Hung Chu, Ming Lun Tseng for receiving "Best Poster Paper Award" at the"15th Nanoengineering and Microsystem Technology Workshop!" 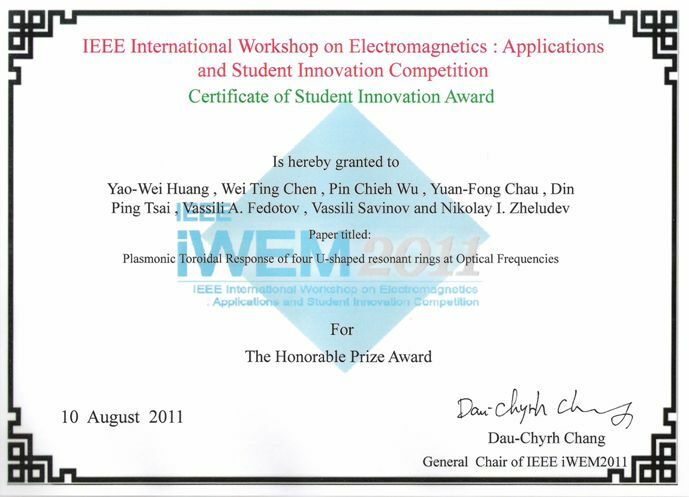 Congrats to our lab member, Mr. Yao-Wei Huang, who received "The Honorable Prize Award" at IEEE International Workshop on Electromagnetics: Applications and Student Innovation Competition (IWEM 2011)! 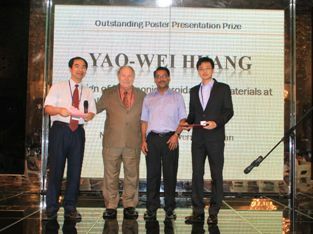 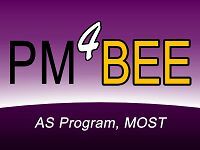 Mr. Chen Jung Chen received "Best Poster Award,"at the International Conference on Materials for Advanced Technologies (ICMAT 2011)! 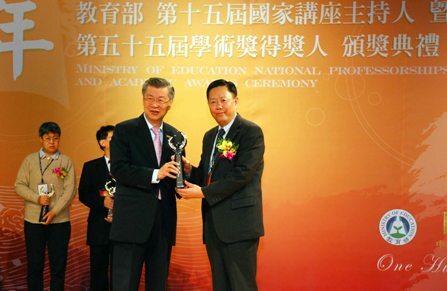 Mr. Wei Ting Chen received 2011 Dean’s Award for Outstanding Master Degree Thesis in 2011! 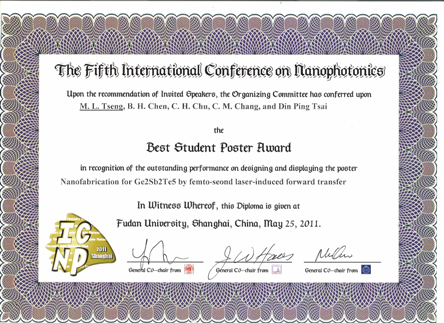 Mr. M. L. Tseng and Mr. C. M. Chang received "Best Student Poster Award,"at the 5th International Conference on Nanophotonics(ICNP 2011)!